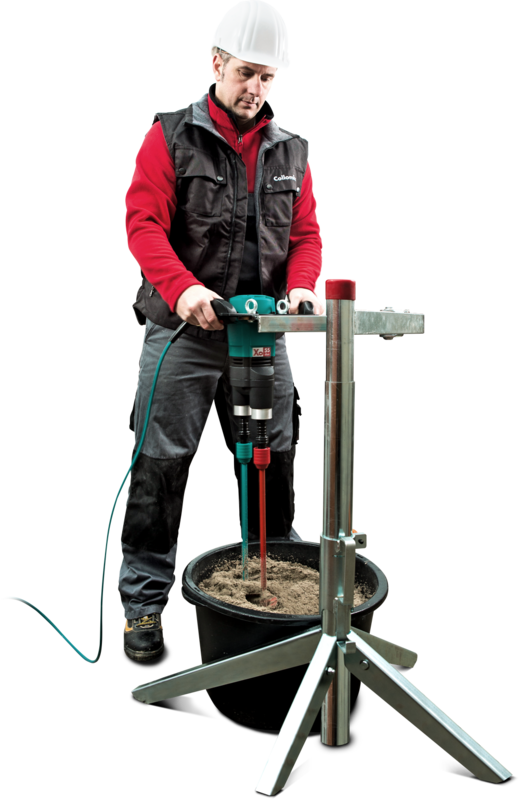 We also offer a large variety of mixing accessories so that you can meet every challenge on construction site. Why Collomix Additional Products ? The secret of the mixing assistant RMX is its swivel arm: This eliminates the physical strain of holding the mixer, leaving the user to simply guide the mixing tool around the container as if it was floating. This also gives the user unlimited freedom to move the mixer, resulting in all the material being thoroughly mixed, for a lasting improvement in quality. Dragging heavy mortar buckets on the construction site itself is not necessary. With the mobile Collomix transport dolly, you can transport your buckets without any physical strain to any place of application. With the dust.EX mobile dust extraction unit, which is used in combination with a dust extractor (dust class M), the dust released can be effectively extracted directly from the mixing bucket. The user is therefore no longer in a dust cloud and is also no longer exposed to the particles. On construction sites or in workshops - This rugged RMX mixing assistant (support arm) copes easily with even viscous and heavy materials. Reliably absorbs and dissipates the generated forces. The RMX mixing stand is an economical alternative to automatic mixers. While opening the bag, filling the powdered material or starting the mixing process, it is simply impossible to avoid generating potentially harmful amounts of dust. This can negatively affect workers’ health and lead to contamination of the workplace. This can be a real problem, particularly when working indoors. The dust.EX dust extraction device is simply clamped to the edge of the mixing bucket in combination with a vacuum cleaner. The clamping spring enables attachment to almost any mixing bucket. Switch the vacuum cleaner on for virtually dust-free working while filling or mixing. dust.EX reliably removes any escaping material. Mixing Know-How for Additional Products !